Just a heads up, but we are trying to amend our constitutional carry provisions here in Idaho to all legal Americans, not just Idaho residents. Constitutional is Constitutional. If this passes, all legal Americans can carry concealed in Idaho without a government permission slip. I’ll update as the bill progresses. Huge thanks to my friend and fellow patriot Representative Christy Zito for sponsoring this bill. She is a true friend of the 2A. Always glad to hear good news from Free America. I've been thinking I may relocate to Idaho after the wife and I retire. Then it would be "Every day is a Saturday - in Free America". That's cool. We're in Idaho once a year, so this would be nice. AZ and CA CCW’s are both good currently. Great job by ID .gov. My wife and I can’t wait to be there full time. We just speed up our 5 year plan to Jan 2021. Update. The bill has been changed to expand constitutional concealed carry to Idaho residents aged 18-21. The portion of allowing non residents to permitless CC in city limits was eliminated. Update. Bill was supposed to be voted on by the house Monday. Was pushed to today third reading. I’ll be back at the Capitol at 3 when they reconvene. Hopefully it gets voted on and passed, although a dem filibuster would be interesting to watch. They are pissed because the Repub’s are not supporting one of their bills. Any state's CCW is good in Idaho. Update. Dems keep f-ing with it. Not voted on today because they are pissed they are not getting support for one of their bills. This is such a freaking simple extension to our constitutional carry provisions. ALL it does is extend constitutional carry to 18-20 yo’s within city limits. They can already open carry anywhere they want. If they are oc-ing and put a jacket on, they are suddenly breaking the law. They can also get a CCW as well which nullifies the whole issue but Constitutional is Constitutional. Back again tomorrow to support my Reps who work hard to keep Idaho free and great. Voted on and overwhelmingly passed in the house and on to the senate. 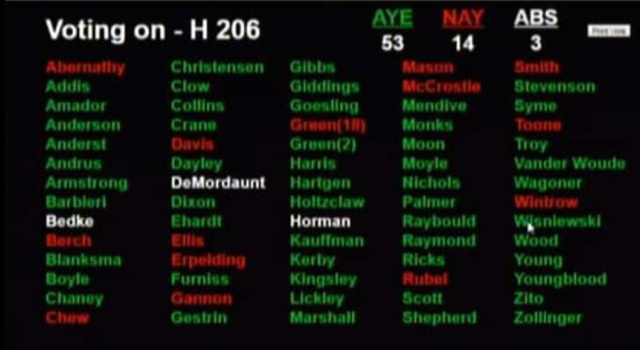 Only holdups and nay votes came of course from the Boise liberal Representatives. Senate hearing supposedly this Monday. Lots of Idaho 2a supporters to attend, including myself. God I love this state. But we must stay vigilant. At least our politicians are pro 2nd amendment and vocal about it. Its probably all because we can't surf and ski in the same day. As do I and yes we must! Suggest joining Idaho second amendment alliance if you haven’t already. Greg does some great work. Don’t hesitate to email the reps and thank them for their stance on pro 2A. They are very approachable and appreciative of feedback. Take care brother. I'm a little confused, so with the current bill non-residents cannot (permitless) ccw in "city limits", are we talking about just Boise, or any incorporated city? Just a curiosity thing, I know I'm good anyplace there with my permit but just wondering about the logistics for fellow riders when we ride through your state. Correct, non residents cannot permitless conceal carry in Idaho. This bill originally was going to try and ameliorate that restriction, but didn’t have enough support currently. So the bill now is just tidying up Idaho’s permitless carry laws for state residents, specifically those aged 18-21. Currently an Idaho resident over 21 may permitless conceal carry or open carry without a permit anywhere in the state, city or rural. 18-21 year olds may permitless open carry anywhere in the state, and permitless conceal carry everywhere except city limits. So basically a 20 year old open carrying isn’t allowed to put on a jacket in Boise without a permit, but I can. That’s what’s getting fixed. It passed senate hearings today with a recommend to approve and a full senate vote. I hope my explanation makes sense. If it doesn’t please let me know so I can try and unwind it for you. I was there again today to support it but didn’t end up testifying. I have an enhanced CWP and encourage anyone wanting to carry in Idaho do the same. This bill is more of a Constitutional statement for me, and therefore, I support it 100%. Adult age is recognized as 18. It’s nice to hear a Senator say, “it’s the Idaho way”. So what about SJR 101, where does that stand? It failed to pass in the house, fortunately. As another Kalifortistanian looking to possibly relocate to Idaho, your updates are helpful, thank you. Please feel free to message me any time if you have any questions or need any information and I’ll do my best to help you out. I was in the Senate today, and Idaho HB206, recognizing the protected civil rights of 18-21 year olds to permitless constitutional carry anywhere in Idaho, passed overwhelmingly 28-7 in the Senate. The usual suspect liberal Senators from Boise and Pocatello were the Nays. It now goes to the Governor for his signature. Another victory for gun rights in Idaho. It’s been great being part of this since its inception. That's great news although 21 is 5+ decades in my rear view mirror. I'll have my enhanced license end of April after I've satisfied the 6 months residency requirement. It would be nice if they removed the gray area where if you don't get the "ordinary" CCW license you can't technically conceal in a vehicle, but you can put the loaded gun on the seat. Congrats. Yes enhanced is definitely the one to have. I actually got the regular one as soon as I moved here, got it in 6 days. Then 6 months later got my enhanced. This was an important fight mostly because it sends a message that Idaho supports constitutional carry for all legal adult Idahoans. Originally it was to be all legal Americans, but baby steps. We didn’t have enough support for that right now. Last edited by nitroxdiver; 03-27-2019 at 8:30 PM.. Signed by Governor Little April 2nd. Done deal. Goes into effect July 1. Another win for Idaho 2A.